Photos credit: UCCP; Teams search for survivors and bodies in the wake of mudslides caused by Typhoon Ompong. While the mid-Atlantic coast of the U.S. still struggles with the aftermath of Hurricane Florence, with many communities still cut off from flooding due to rivers that are only now beginning to crest, Typhoon Mangkhut -- known as Ompong in the Philippines -- made landfall on the northern tip of Luzon on Friday night local time and has decimated much of the Philippines with winds of over 125 mph. Rev. Melzar Labuntog, General Secretary of the United Church of Christ in the Philippines, reports that there are upwards of 2500 church families who are in need of food due to their homes and livelihoods being destroyed. Forty-nine of the Church’s communities need seeds to replant gardens and farms that were washed away. 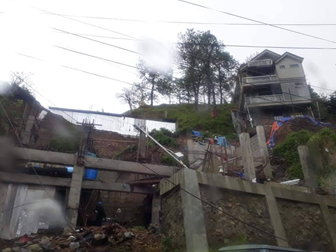 Many people were buried alive in landslides in the areas of Baguio City, Kayapa, Nueva Vizcaya and Itugon, and Benguet; 41 bodies have been retrieved with more expected to be. Other news reports note that at least 70 people have died, including 50 people who had taken shelter in a chapel in Itogon. Another 50+ are still missing as of this writing. Accuweather reports that debris was hurtled through the air as the powerful typhoon crossed the northern Philippines, with roofs being ripped off of homes, businesses and many trees and power lines downed. “Almost all of the buildings here have been damaged, the roofs were blown away,” said Rogelio Sending, a government official in Tuguegarao. “There has been no electricity supply ... communications were also down." Adelfa Lunato and her family arrived back at their tiny fishing village in the coastal Cagayan province. The modest house that she shared with her parents and grandmother was in pieces. The walls had crumbled and only the thin wooden frame remained. As she told CNN, "It was so devastating to see that our house was destroyed," said Adelfa. "We were all crying. Seeing this damage for the first time, it was like losing our will to live." Through Global Ministries, our partner the United Church of Christ in the Philippines, has requested our help in channeling monetary aid, medical supplies, food, and monies to assist families who have been directly affected by this severe storm. Week of Compassion will continue to work with our partners in the days and months ahead to help communities impacted by this devastating typhoon to rebuild. We seek your prayers for those who are grieving, for those are caring for their neighbors, and for the restoration of these communities. Your continued gifts to Week of Compassion will, through the work of our partners, bring help where it is needed. Thank you. 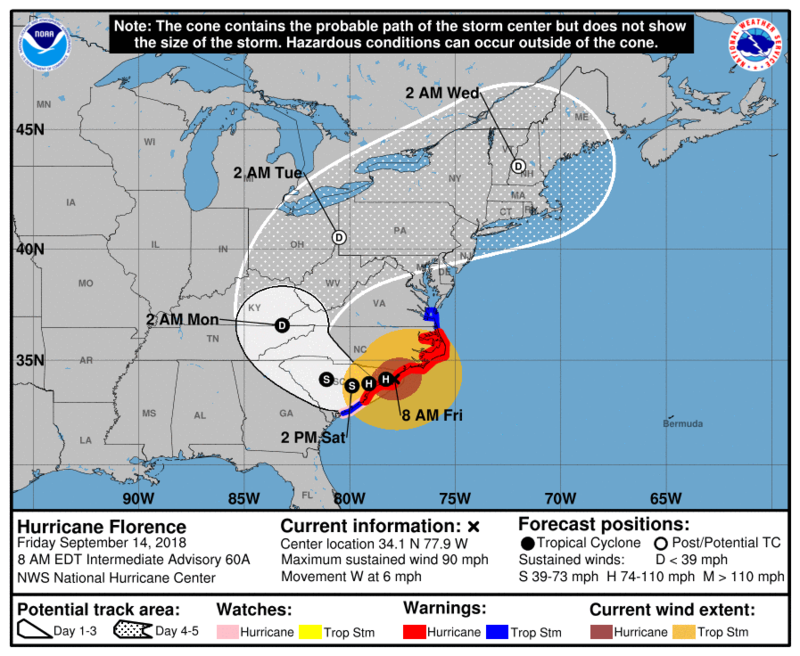 As Florence tracks north away from the Carolinas, the effects of the intense rainfall continue to develop, especially in central and southeastern North Carolina. Rivers across much of the state have been overwhelmed, with some expected to crest today, while others are predicted to continue rising through the week. Week of Compassion is in regular contact with the Regional staff and ecumenical partners in the area. We are slowly receiving reports from congregations, though many places are still under evacuation orders and road closures further limit access. As of this morning, we have received reports of confirmed damage at First Christian Church, Wilmington and Armenia Christian Church in Kinston and likely damage at Southwest Christian Church in Kinston. We anticipate receiving additional reports through the week. Camp Caroline also sustained damage, including leaks and minor flooding in multiple buildings. Camp Director Casey Perry wrote in an update yesterday: “Camp Caroline came out on the other side! We do have quite a few downed trees and power lines around camp. Due to the current condition of camp and our concern for your safety, we have closed camp until October 1.” To read his full update, including ways to help, visit the Camp Caroline Facebook page. Christmount Conference Center continues to host evacuees. Southwood Memorial Christian Church in Kinston is feeding several dozen first responders breakfast and dinner daily. Greenleaf Christian Church in Goldsboro has been distributing food and water. First Christian Church, Plymouth and First Christian Church, Wilson are hosting blood drives. First Christian Church, Greenville has been helping members and neighbors clear trees and other storm debris. Multiple congregations are in conversation with our ecumenical partners and other organizations to host volunteers for cleanup. While we all hope and pray that the destructive impact of Hurricane Florence will be less than predicted, we also want to make available to you worship resources for this Sunday that you may wish to use in response. Pray, Stay, and Give: In the midst of this or any natural disaster, Week of Compassion invites you to PRAY for those affected and those who are first responders, STAY -- as much as you might want to go the the disaster area to help your presence can actually cause more harm than good right now (and there will be plenty of opportunities as recovery gets underway), and GIVE: Give through your congregation or through Week of Compassion’s website; 100% of your gifts designated for Hurricane Relief will go to that cause. Below you will find worship resources for this Sunday that may help you and your congregation come before God in prayer for all those affected by Hurricane Florence. Leader: God is our refuge and our strength, an ever-present help in times of trouble. Therefore we will not fear. People: Though the earth give way, though the seas roar, though the winds howl in their fury. Leader: God is with us; God does not fail us. People: Let us be still and know that God is indeed God, the One who never leaves us adrift, the One in whom we and all the earth live and move and have our very being. Leader: Thanks be to God! Amen. People: We pray for those who have lost loved ones, those whose homes are in tatters, those whose livelihoods have been lost, those who have been injured. Leader: May God’s tender grace be with them, may God’s loving arms enfold them, may God’s hope grant them courage. People: We pray for those who respond with bravery and dedication and skill in the midst of danger and loss: for firefighters and paramedics, police and soldiers, doctors and nurses, pastors and counselors, and all those who give of themselves to serve their neighbors in need. Leader: May they know rest in the midst of danger, perseverance in the face of overwhelming need, and the thanks of those whom they serve. People: We pray too for ourselves, O God. May too many needs, too much sorrow, never leave us jaded or calloused. May we open our hearts and offer our prayers and our gifts to those who are hurting. May we never lose hope. Leader: O God our help in ages past, and our hope for now and years to come, be with all those who need you in this and every hour. May it be so, in the name of Father, Son, and Holy Spirit, one God, Mother of us all. Amen. Hurricanes and natural disasters bring out some of the best in people. Folks of every race, of every religion or no religion, of every class, step forth to help those who are hurting, whose lives are in shambles, who may wonder if anyone cares about them in the midst of so much suffering. They need not wonder, for folks with trucks and boats have helped carry people to safety, have helped get desperately sick people to hospitals, have tried to make sure that families stay together and have a safe place to recover. But please know this: We too are those people. We may not drive a truck or pilot a boat, but we too can help our neighbors in such dire need. We may want to join our hands to those on the Atlantic coast but now is not yet the time. But we can pray. And we can donate. Every dollar that you give for Hurricane Relief to Week of Compassion, our wider church family’s disaster relief ministry, will go to work through our partners to assist those impacted by this terrible storm. Those dollars will continue working too; long after the headlines have faded and the cameras have been turned off, Week of Compassion and its partners will still be there – as they are in Texas and Puerto Rico and the Virgin Islands – helping with long-term recovery. Will you give generously, knowing that your gifts will help both right now and in the months and years to come? O God, you have been our rock, our comfort, our hope from generation to generation. For your abiding love that never leaves us, for your grace that enfolds this whole earth, for your care which invites us to care along with you, we are grateful. This morning our prayers are especially with all those in every part of this world who are dealing with natural disaster, but especially those in the path of Hurricane Florence. We pray for those who have lost loved ones, for communities that are in tatters, for lives that have been upended and livelihoods destroyed. We pray that all of these would know your presence, and that they might know that they are cared for by folks near and far. We thank you for all who brave danger to assist those in need: firefighters and police and paramedics and doctors and nurses and soldiers and counselors. Be with them, O God, in their noble and too often scary work. Finally, O Lord of Life, we pray for ourselves. May we open our hearts and hands to the needs of our brothers and sisters, may we pray for them daily, may we dig deep to give of our resources to assist. We thank you, God, for the privilege of doing these things, to help in your name, the One whose love lets none of us go, now and forever. Amen. In communion with Christ, we are joined with the trials and sufferings of all. This morning we pray that through Christ we too would be with those who endure the wind, rain, and flooding from Hurricane Florence. As we come to this Table, we pray to the Lord: Protect those in the path of danger, open the pathways of evacuations, help loved ones find one another in the chaos, provide assistance to those who need help. May Christ’s presence be known to all those who are fearful and discouraged, just as He makes His presence known in the breaking of the bread and the sharing of the cup – at this Table and around the world, in every nation, among every people. These are the gifts of God for God’s people! Let us come with joy and gratitude and hope. High school volunteers from First Christian Church of North Hollywood prepare wall texture for a home damaged by Harvey. One year ago, Southeast Texas was in the midst of the fourth day of the deluge caused by Hurricane Harvey. The storm, which made landfall on Aug. 25, had stalled out southeast of Houston and was dropping unprecedented amounts of rain. By the time the storm moved out of the state on Aug. 31, an estimated 1 million households had sustained damage to their homes and millions of people had been traumatized. During the past year, communities across Southeast Texas have been working for recovery, aided by hundreds of thousands of volunteers and millions of dollars in cash and material donations. Week of Compassion saw a dramatic increase in support and giving. Because of your generosity, Week of Compassion was able during the period of early relief to provide solidarity grants to 241 affected Disciples families and 25 Disciples congregations. Week of Compassion staff have provided, and continue to provide, pastoral support for clergy in the area, including collaborating with National Benevolent Association and The Pension Fund to offer clergy mental and spiritual health retreats. We have also been coordinating with local partners to begin the long process of assisting affected families who do not have the resources to recover on their own. A study published last week by the Kaiser Family Foundation and the Episcopal Health Foundation indicates that 1 in 5 residents in affected counties had severe damage to their homes. Among those who reported damage to their homes, "41 percent say it has been restored to a livable condition but not the same as it was before Harvey." Additionally, "one in six (15 percent) of those residents who experienced home damage say their home was still in an unlivable condition" at the time of the study, 10 months after the storm. In some of the hardest hit areas, that share rises to 25 percent. The needs are great and there is significant work ahead, and Week of Compassion is committed for the long-haul. Week of Compassion will continue to walk alongside the people of Southeast Texas, assisting as many people as possible in making their homes livable again and promoting healthy, resilient communities. On the 1 year anniversary of the storm, the Forum--a fellowship hall and alternative worship space, which had been filled with 2 feet of water during Harvey--was the site of a wedding and the following day the location of a worship service marking the anniversary of the storm. Through dance, prayer, personal stories, and song, the community named their continued struggles and rejoiced in how far they have come. During one personal testimony of evacuation, loss, and recovery, a member of the church said, "There is a light that shines in the darkness, and the darkness cannot overcome it. I know, because I've seen it." Of the two dozen families at Cypress Creek CC who had significant damage to their homes, all have either moved to new homes or moved back in, though a handful still have repairs to complete. Members of the dance classes hosted at the church, which will begin again this fall, offered a prayer in movement during the anniversary service at Cypress Creek Christian Church, held in the repaired Form building. Video courtesy of CCCC. "We're alive and well, by prayer and dollars!" said Norma Lowry, Director of the Community Center at Cypress Creek Christian Church, who has been managing the building repairs since Harvey caused severe flooding across the church campus. She went on to say that they still have challenges ahead with significant repairs to complete on the community center building. Beyond cleanup and remediation, they have not even begun repairs on the sanctuary. "Early on," said Senior Pastor, Rev. Bruce Frogge, "I preached that we would rebuild with others in mind first, which is why we prioritized the offices used by the Interface-Samaritan Counseling Center. Our community needed them, and they have since provided many many hours of free counseling to people affected by the floods." In addition to those areas, the staff offices, youth and children's wings, chapel, and forum building (a combination fellowship hall and worship area) are now repaired and back in full use. Rev. Danielle Cox and members from FCC Texas City marked the anniversary by volunteering with Galveston County Recovers to do home assessments for people still in need of assistance around the county. Galveston County Recovers, where Rev. Cox serves on the communication committee, is a local group of non-profit organizations, faith communities, and government partners who work together to coordinate recovery efforts. Week of Compassion and Disciples Volunteering have been partnering with Galveston County Recovers to provide home repairs for some of the most vulnerable survivors of Harvey. Since last fall, FCC Texas City has hosted a Disciples Mission Station, where volunteers have repaired damage at the church building and at homes in the surrounding areas. Well over 300 volunteers at the Mission Station, contributing roughly 10,000 hours of labor, have helped 18 families return home. Though the schedule was full through the summer, very few volunteers have registered for the fall. To find out more, visit: www.discipleshomemissions.org/servants-needed. Steve Huston helps welcome and lead mission groups as a long-term volunteer at the Disciples Mission Station in Texas City. Of the twenty-two Disciples churches who reported damage, most have completed or are near completing repairs. First Christian Church, Port Arthur, which had the most severe flooding among the affected congregations, continues to make progress, though extensive work remains. They have hosted many volunteers, who have worked both at the church and in the community. Bethany Christian Church in Corpus Christi is similarly still in the process of fixing interior damage, having completed a full roof replacement and repairs to exterior damage. Iglesia Cristiana El Redentor in Houston has repaired their fellowship hall and sanctuary, but four classrooms are at various stages of completion. A few months ago, we reported to you on terrible famine conditions in Kenya due to ongoing severe drought. In a cruelly ironic turn, in the late spring, torrential rains and flooding made the famine crisis even worse. Week of Compassion partner, Church World Service, reports that over 300,000 people along the Tana River in Kenya were affected by floods, and the death toll was 118. While you may think that rain would be a blessing to drought-plagued areas, too much rain in too little time on soil that has been so hardened and baked under the relentless sun (which cannot, therefore, absorb water) leads to devastating runoffs and rivers that overflow their banks. In hardest-hit Tana River County, over 12,000 households lost a total of almost $4 million dollars’ worth of crops. Aided by your gifts to Week of Compassion, Church World Service is leading the response to the flooding in Tana River County. Together, we are serving 910 households -- or nearly 7,300 people -- as they temporarily reside in camps on higher ground. Those driven from their homes by the floods receive food kits containing maize, rice, beans, cooking oil, and three water containers per household member. 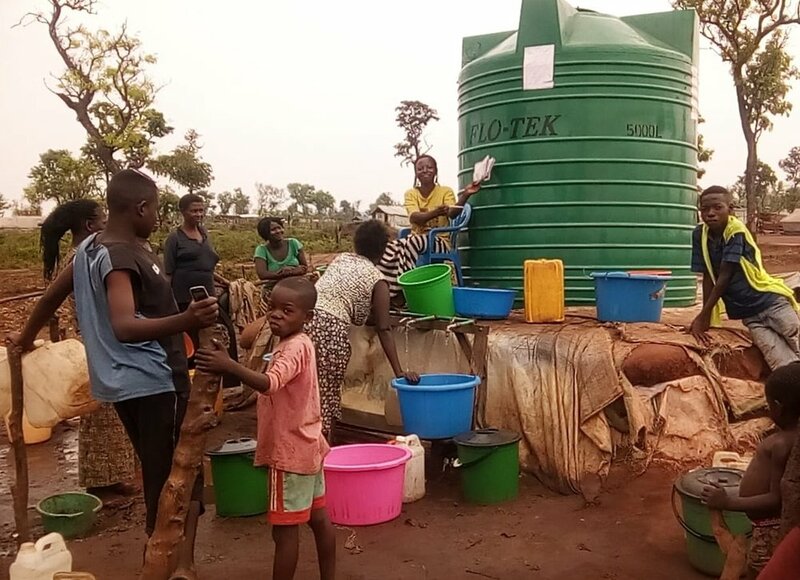 Clean water (and safe sanitation facilities) are also a essential priorities for these displaced folks, and Church World Service has made available water purification systems to every household, along with community water tanks and mobile toilets. Behind each of these statistics is a family threatened by disease and hunger. Your gifts to Week of Compassion give families relief from those fears and hope for the future. Yesica and Yani were small children when their mother left El Salvador to make the journey to the U.S. They grew up with their grandmother and made weekly phone calls to their mother in the United States. Their mom's earnings from the U.S. allowed them to go to school. When Yesica and Yani were eleven and thirteen their walk to school changed. Someone started following them as they walked along the only highway leading to their school. After a few days that someone showed his face. They knew who he was. Everyone knew who he was: a gang member who had threatened their neighbors. Everyone in the neighborhood believed this young man and his associates had killed the uncle of a neighbor. Of course, they didn't have proof because the police wouldn't investigate. It was likely that the police were on his payroll. But when he told Yesica and Yani that they had to be his girlfriends, they understood what that meant. They understood that girls forced into his gang were constantly raped by all its members. They understood that to refuse meant certain death. When Yesica and Yani finally told their mom what was going on, she immediately sent all her savings to El Salvador to pay to bring her daughters to the United States. She did not take lightly her decision to send her daughters on foot and atop trains across thousands of miles of desert and danger. She tried not to think of her own journey. She tried to get the girls on birth control, knowing the likelihood of assault on the road. It was a weighty decision, yet it was hardly a choice. Yesica and Yani arrived at the U.S. border after being abandoned by a smuggler in the desert. They were detained by Customs & Border Protection. Despite their dehydration and exhaustion, they managed to express their fear of returning to Honduras convincingly enough to be allowed to apply for asylum. Months later the immigration judge refused to hear their claims. They were deported to Honduras in 2012. Their fate is unknown. Tana Liu-Beers, Disciples Immigration Legal Counsel and former representative of Yesica and Yani, notes that cases like these are far too common and are even more likely under current immigration policies. On July 12, 2018, the U.S. immigration agencies, by order of the Attorney General, further foreclosed claims of asylum based on gang violence and domestic violence, which will undeniably result in more youth like Yesica and Yani being sent to their deaths. For the sake of young people like Yesica, Yani, and countless others, Week of Compassion works with partners such as Disciples Immigration Legal Counsel, Disciples Refugee and Immigration Ministries, and Church World Service Immigration and Refugee Program to support advocacy and legal assistance. In the name of Jesus, who himself found safety and shelter in a foreign land, we seek the fair, compassionate, and hospitable treatment of immigrants and asylum-seekers. In December of 2017, Marie (named changed for privacy) moved back into her home in Bertie County, North Carolina, just in time for Christmas. Over a year before, in October of 2016, 5 feet of water filled her home during flooding caused by Hurricane Matthew. Since that storm, many others have filled the headlines and captured our hearts and attention, most notably Hurricanes Harvey, Irma, and Maria, which caused such extraordinary damage last fall. Now, the 2018 Atlantic Hurricane Season is upon us. 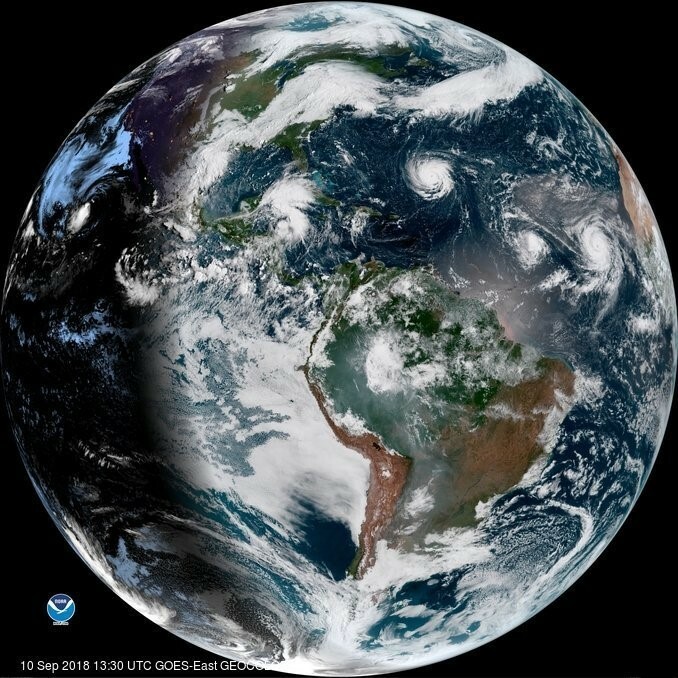 In fact, before the official start of the season on June 1, the first named storm of year, Subtropical Storm Alberto, formed in the Gulf of Mexico and doused the Southeast with heavy rain. High winds and high water caused damage from Alabama through Virginia. A swollen creek washed out a road at Christmount Retreat, Camp, and Conference Center. In western North Carolina, a creek swollen by rains from Alberto washed out a road at Christmount Retreat, Camp, and Conference Center, potentially putting at-risk the busy summer camping season so important to youth and adult faith formation. As the summer camp schedule begins, Christmount will be able to make necessary repairs, with support from Week of Compassion. "Talk about fast, and on the ball," said Rob Morris, Executive Director at Christmount. "When the wind and rain washed our road away, Week of Compassion called the very next day. Now we're back up and running... thanks for the work you do." Season after season, storms come, causing damage and disrupting lives. And storm after storm, Week of Compassion is there to provide support, assistance, and hope. Even as new seasons bring new storms, we walk with and work alongside communities in the process of recovery, not just in the immediate aftermath, but for months to come. On the other side of the state, in Cumberland and Robeson Counties, as well as in Bertie County, recovery continues from Hurricane Matthew. Week of Compassion has helped enable community organizations to provide furniture to families moving back into their homes, to host recovery fairs where survivors can learn about available resources, and to facilitate home repairs. Recovery continues, as well, in Volusia County, Florida, where many residents sustained damage both during Hurricane Matthew in 2016 and Hurricane Irma last fall. Volusia Interfaiths Networking in Disaster (VIND), which is housed at First Christian Church, Daytona, has helped dozens of homeowners move back into homes that are more resilient for future storms. "Homes are ready for repairs. We need more volunteers!" says the staff of VIND (click here for volunteer information). Volunteers can also make an impact in Southeast Texas, where Hurricane Harvey caused catastrophic flooding. First Christian Church, Texas City is serving as a mission station with Disciples Volunteering. Texas City is part of Galveston County, an area where already vulnerable communities--with above average rates of poverty and aging populations--experienced devastating flooding. A local pastor and leader in the recovery describes the situation as a compelling story of need, but also one of great hope, as people have been reaching out to serve their neighbors. (click here for mission station information). In Puerto Rico, where the damage from Hurricanes Irma and Maria is still extreme, and where electricity is still unreliable nine months after the storms, the congregations of the Iglesia Cristiana (Discípulos de Cristo) are combining recovery efforts with disaster preparedness. Last month, a group of Disciple pastors began designing and implementing a disaster communication network, which will connect congregations across the island in the event of an emergency. Additionally, as a program of home repairs is getting underway, additional investments in stronger materials and resilient building techniques will make homes safer in future storms. Thank you for your faithful partnership and generous gifts, from season to season, storm upon storm, year after year. From hurricanes to earthquakes to tornadoes, disasters can happen anywhere. If you are prepared before a disaster, you are more likely to be in a position to help after. Find resources to prepare for hurricanes and all kinds of disasters at Ready. Encourage your church to be prepared, too! Emergency Management in Georgia has compiled a great set of resources for congregations called Praise and Preparedness. "The Horn of Africa is facing its third consecutive year of drought causing thirst and hunger, decimating livestock, destroying livelihoods, spreading disease and triggering large scale population movements." There is an almost unimaginable amount of misery contained in this statement from Week of Compassion disaster relief partner, ACT Alliance. Beneath this broad description is a daily struggle to survive by millions of people in what continues to be one of the most under-reported stories of our time. The horror of this situation is real. It is so very dry in Somalia that even the famously drought-resistant camels are dying. And in a country where so many people earn their meager livelihoods from agriculture, the death of such animals is life-threatening. It is so very dry in Kenya, that upwards of 70% of crops failed last year. Imagine having your food intake reduced by 70%. Imagine it for your children. There are over 2.5 million Kenyans who aren't imagining it but are forced to live it - with the consequent increase in infant deaths, stunting of children's development from malnutrition, and increase in devastating disease due to weakened immune systems from lack of adequate nutrition. Hackworth says, "Decades of civil war, economic and ecological strife keep South Sudan on the brink of famine. As this is the world's youngest country, it is critical now that caring people around the world- including donors to Week of Compassion - support the men, women and children at risk." One of those children is named Teer Majak. He was brought to an IMA facility where he was diagnosed as severely malnourished with medical complications including convulsions, loss of appetite, high fever, sunken eyes, and yellowish skin. He was stabilized, his medical conditions addressed, and soon he began to grow and gain weight. In just three weeks he showed significant improvement. Following a stay in an out-patient therapy and feeding program, he was able to be discharged with the hopes of now living a life not wracked with the effects of chronic malnutrition. The horror is real, but it does not need to be the end of the story. Week of Compassion has been responding to these crises and supporting our partners to provide relief. Medical feeding centers, like the one that saved Teer provide critical nutrition, as do school feeding programs and supplies of maize and beans, which are distributed in areas of extreme crop loss. Cash vouchers for food and wages earned through well-restoration projects help bolster agriculture-dependent economies and provide food and water. Water purification and pond de-silting efforts increase the availability of potable water, and hygiene and sanitation supplies help curtail water-borne diseases. Join us in observing a "Global Day of Prayer to End Famine" on June 10, 2018. Global Ministries and World Council of Churches websites have ideas for helping make folks aware of the need around the world on that day. Continue to seek out stories about this situation and help keep the plight of these brothers and sisters in your and your fellow church members' consciousness. Make a gift to Week of Compassion designated for famine and drought relief, where 100% of your support will go to provide relief to affected communities. In March of 2016, flooding swept across much of Louisiana. In Ouachita Parish (in upstate Louisiana, between Shreveport and Vicksburg, Mississippi), the heavy rainfall created a strong flow of water--strong enough to displace the foundation piers of homes. One such house belonged to man whom we will call Mr. Jones (he asked that his real name be kept private). The foundation movement at Mr. Jones's home caused the roof to leak, the outside walls to shift, and the floors to buckle and bulge. Gaps along the walls, floors, and roof allowed rainfall into the home, causing further damage and extensive mold growth. Mr. Jones is a 63-year old disabled father of 8, who lives with chronic illness. After the flood, this large family moved into a 2-bedroom apartment, where they are still living. Though on a fixed income, Mr. Jones continues to pay bills on both residences. He was able to make some minor repairs himself, but the family could not afford to make the repairs to the roof or to the floor joists, sills, floors, and ceilings. FEMA funding helped them purchase an air conditioner (an attempt to dry the home and reduce mold growth) and replace the children's damaged clothing, but it was insufficient to repair the home. State recovery programs have been slow to help, and John has been waiting for over a year to find out how much state funding will be available to assist with the repairs. Without addressing the major problems, the conditions of their home continued to deteriorate. Things got more difficult in Ouachita Parish when, later in 2016, the southern half of Louisiana again flooded, including historic flooding in Baton Rouge. Much of the attention, money, and volunteers shifted away from Ouachita and other rural Parishes upstate, and away from families like the Joneses. But Islamic Circle of North America (ICNA) Relief USA stayed, providing case management services and coordinating repairs in the parish. Through the partnership network of National Voluntary Organizations Active in Disaster (NVOAD), ICNA reached out to Week of Compassion. Our shared values of community-led recovery, prioritization of the most vulnerable, and accompaniment through long-term recovery made ICNA Relief USA an ideal partner. Week of Compassion provided funds for building materials, which ICNA Relief USA leveraged for donated supplies and labor, thereby doubling the return on investment. At the Jones's home, Week of Compassion and ICNA Relief USA have removed the collapsing chimney, repaired the roof, replaced the floor joists and floorboards, repaired a wastewater line, and laid new subfloor and flooring. The work continues to make the home safe, sanitary and secure. The work continues through partnership with ICNA Relief USA and through your generous gifts to Week of Compassion. You can help create a long-term future for those suffering from disasters, poverty, hunger and displacement from home! The Week of Compassion Endowment Program was established in 1997 within the Christian Church Foundation to ensure that the witness and mission of Week of Compassion continues for generations to come. Annual distributions from the endowment now provide ongoing assistance long after disasters and crises are forgotten. The Week of Compassion General Endowment - Any amount. A Named Endowment Fund - A commitment to grow your fund to at least $1,000 over time. The fund can be in your name or named in memory or honor of a loved one. A Circle of Compassion Fund - Congregations join the Week of Compassion Endowment Fund through the Circle of Compassion, with a commitment to grow the fund to at least $10,000 over time. For more information about how you can offer an ongoing presence providing relief for the suffering, recovery to families after disasters, and respite for refugees - today, tomorrow, and for generations to come - contact Week of Compassion's Minister for Development, Rev. Joe Hendrixson, (785) 640-0557 joe@weekofcompassion.org. Thanks to your gifts, Week of Compassion is always about the work of Easter - every day, around the world! We know that, indeed, all life is sacred and so we seek to help folks recover from natural disaster, to help our brothers and sisters who live in poverty seek better lives through Fair Trade and sustainable agricultural practices, and to assist in the empowering women around the globe to lives of greater dignity and hope. Easter means that not even the worst that the world can do will ever defeat the love of God! And Easter therefore is our call to follow God's lead in not letting the "powers and principalities" defeat our hope, and to do all we can to witness to the possibility of resurrection and of new life. It sometimes seems, again Christian writer Anne Lamott says, that "we are an Easter people living in a Good Friday world," for pain, suffering, and injustice are too much a part of too many lives. But God's call to us is to indeed live as Easter peoples, knowing that every effort we make to alleviate that pain and suffering and injustice is a sign of resurrection and new and renewed life. These efforts would be far less possible without your prayers and your gifts to Week of Compassion. Thank you, thank you. "Be," Lamott says, "a resurrection story"! Together we shall continue to write new chapters of that story, every day, around the world. In September of last year Hurricanes Irma and Maria, two Category 5 storms, slammed into the United States Virgin Islands just ten days apart, causing crippling damage to vital infrastructure such as water, power, and communications, as well as homes and businesses. Realizing that there were no local disaster-specific NGOs based in the USVI, the Disaster Recovery Support Initiative (DRSI) deployed Rachel Larratt, long-term recovery group formation advisor, to support the formation of long-term recovery groups, working alongside local community leaders, NGOs and voluntary organizations, and both federal and local government agencies. Larratt was joined in January by Tim Sheaffer, DRSI construction management advisor, and long-term volunteers Marks Beitins and Marcy Magness-Sheaffer. DRSI is a joint endeavor of Week of Compassion, Disciples Volunteering, and the disaster ministries of the United Church of Christ and the Church of the Brethren. It works to help communities shorten the time between an immediate disaster response and long-term recovery. DRSI is building disaster recovery know-how among local leadership and equipping them to better respond to future disasters. The partnership has also been able to leverage funds committed by Week of Compassion and the other denominations to secure additional recovery funding from other organizations, including Church World Service, the Community Foundation of the Virgin Islands (CFVI), and the E. Rhodes & Leona B. Carpenter Foundation. Last month, DRSI received a grant of $212,000 from the Fund for the Virgin Islands through the CFVI. According to the grant awards letter, an important factor in the review committee's decision to award the grant to DRSI was its "experience in case management and LTRG capacity-building, which has served as an important mentorship to the St Thomas Recovery Team (and others), expediting its effective formation." The needs on St. Thomas are staggering, Larratt said. With a pre-hurricane population of 51,642, 18,258 households have registered for assistance with FEMA (the highest in the USVI). "Elevated rates of unemployment due to the storms' impact on tourism, along with a rise in the cost of consumer goods (including construction materials) in a territory where the cost of living was already 24 percent higher than the U.S. average, means that residents have difficulty meeting even their basic needs, much less finding the resources to repair their damaged and destroyed homes," she said. "Current assessments estimate over $80,000,000 in unmet needs. For those identified as having sustained moderate to severe damage to their homes, estimated average repair costs are $32,780 per household." Your gifts to Week of Compassion have enabled us to respond to these needs and to enhance the capacity of the local response. As recovery continues in the US Virgin Islands, your partnership continues to make a difference! Thousands of homes that suffered roof damage are still leaking and growing mold with every passing day. While the necessary case management and funding for repair and rebuild work are still in process, there is much we can do! Homes need to be cleaned out, tarped to protect from rain, and treated for mold so they do not continue to deteriorate until they can be properly repaired. The DRSI team has identified churches that are willing to host volunteers, and we are preparing for your arrival beginning with the week of April 8th! "Just ask your phone, Daddy." "Mommy, just Google it." "Hey Google....?" Even ten years ago, such sentences would have seemed nonsensical, but nowadays for most North Americans the easy availability of information through search engines and cell phones is nearly ubiquitous. 95% of Americans own a cell phone, and 80% own a smartphone. Such ready access to empowering information is something that North Americans have come to take for granted. It's not that way everywhere. In Guatemala, for example - and particularly among the women of Guatemala - the lack of ready access to information has made life harder than it needs to be. A report from the Carter Center puts it succinctly: "we know that information related to education, starting a business, and basic rights is the most critical for women's economic empowerment and the promotion and protection of rights.... With genuine access to information women can make more effective decisions with relation to education, land, and agricultural production." Through the support of Week of Compassion, the Carter Center's "Global Access to Information Program" has worked with Guatemalan partner Acción Ciudadana to increase women's access to information. Over 2000 women in Guatemala have been exposed to the opportunity to learn how to find information that will enhance their lives and economic security. Acción Ciudadana has hired a team of local women to help other women obtain the information they need to better their lives and the lives of their families. Provisioned with laptops, the teams visit villages that have limited information access. Three hundred women have received assistance in making information requests regarding their rights or in securing information about resources available to them or their families. Again in the words of the Carter Center, "With genuine access to information, women can take advantage of opportunities to transform their lives, families, and communities." 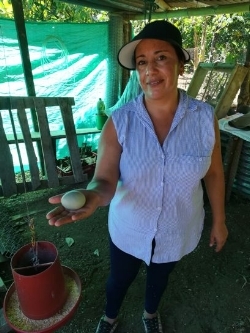 Two brief stories show the power of information to create hope and transform lives: In one of the most impoverished and isolated areas of Guatemala, a woman had been promised chickens from one of the government agencies but had never received them. A Carter Center staff walked many hours and many miles into this village and was able to help the woman remind the agency of her request and their promise. Not long after, well over 100 chickens arrived -- which gave her children better nutrition (malnutrition in this part of the country is a dire problem) and allowed her to have the means to now supplement her family's income through the sale of eggs. A second woman, 34 years old, who suffered from epilepsy was assisted by Carter Center staff to find out what assistance was available from the government and to make a request for -- and receive! -- help in accessing a specialist to assist her with her medical situation and the drugs she needed. On this International Women's Day, we are grateful for your support and financial gifts to the Week of Compassion Women Empowerment Fund, which helped make this work possible in places such as Guatemala and all over the world. Information IS power, and power IS hope - for the betterment of women and their families! Thank you! Learn more about Week of Compassion's Women Empowerment Fund. I had the opportunity to be in Puerto Rico this past weekend to attend the 109thAnnual Convencion of the Iglesia Cristiana (Discipulos de Cristo) in Puerto Rico (ICDCPR) where hundreds of clergy and delegates came together for their annual assembly. There was time for worship, reports on the different ministries and committees of the church, prayers for one another, and gratitude to God for the gift of being in fellowship with each other. The General Pastor, Rev. Miguel A. Morales Castro, gave an update on the church's recovery efforts from Hurricanes Irma and Maria, and while there has been much struggle due to the impact of the storms, the church continues to serve its community and other people in need. It has been close to five months since the impact of Hurricanes Irma and Maria, and today, places that are away from the city, especially remote communities in the mountains, are still struggling to get access to basic needs like electricity and clean water. Many places are still without electricity. They must continue using loud, diesel fuming generators, such as at ICDC in Dajaos, Bayamon, the church where we gathered for our assembly. In the midst of so much destruction, the theme of the assembly was "Serving in Spirit and in Truth," based on 1 John 3.18 and Philippians 2.5-11. As the church tries to rebuild itself, it also recognizes the call to serve the community by partnering in feeding and opening doors.The focus on not forgetting to serve these vulnerable communities remains at the heart of the convencion gathering, and it also remains as our focus for Week of Compassion. Week of Compassion is working with our partners in slowly transitioning from immediate relief to long-term recovery efforts. In partnership with the Iglesia Cristiana (Discipulos de Cristo) in Puerto Rico, we are developing a long-term plan to partner with local congregations and agencies in rebuilding many homes, but more importantly, many lives. As I received words of "Muchas Gracias" from so many of our brothers and sisters on this island this past weekend, it's really a gratitude to you, our church and supporters, in this long recovery work. We remain committed to rebuilding Puerto Rico for the months and years ahead, as well as other places around the world that have experienced disasters. In a few months you will hear from us about opportunities to partner with us in Puerto Rico to help and work on some of these homes. Through your gifts to Week of Compassion, especially this week during our special offering, you are joining Disciples in Puerto Rico in "Serving in Spirit and in Truth." Your generosity strengthens our partnership in the much needed, long term recovery of the island. 2017 saw a series of disasters, both in North America, and around the world. One of those that received too-little attention was a devastating mudslide in Mocoa, Colombia. In the early morning hours of April 1, 2017, increased rainfall caused the Mocoa, Sangoyaco and Mulata Rivers to overflow, which in turn generated a mudslide in the municipality of Mocoa, capital of the state of Putumayo. Over 20,000 men, women, and children were made homeless, the local water and sewer systems were badly affected, ten local roads and seven bridges sustained damage. Six neighborhoods were totally destroyed and seventeen were seriously damaged. Because many of the folks in the Mocoa area depend for their livelihoods on agriculture -- growing cassava, coffee, cacao, among others, as well as raising poultry -- the mudslide triggered a serious threat of food shortages for hundreds of residents. Agricultural production capacity was completely destroyed due to the disaster. The local market was also destroyed, and with no income from these activities, many residents could no longer pay the debts they'd incurred for small business or agricultural purposes. Through your gifts and prayers, Week of Compassion was able to work with partners to assist the residents of this disaster through immediate supply of food, water, and temporary shelter, along with cash gifts to 150 households to allow them to resume their work quickly and to pay livelihood-related debts. Disciples Global Mission Partner Michael Joseph reports "Some bought hens, some pigs, and some bought supplies for family-run businesses (stores, beauty salons, barber shops and restaurants). The project also provided them with workshops in trauma recovery, investing, and financial skills." Michael also shared some of the thoughts from those this effort helped: "This project helped us take a step forward. Today my wounds are healed. Now I can go forward even stronger than before." "With this money I was able to get my beauty salon up and running. I even had enough money left over to buy something for my children for Christmas. Thank you for giving us this money with no strings attached." "This project has allowed me to start over again. When I lost everything I felt so small. I asked several banks for loans, but they turned me away because I had lost everything. This aid has allowed me to be reborn." It is truly amazing what such a seemingly small amount per family has been able to do to allow folks to quickly recover from their losses and move forward with their lives and work! Thank you for your gifts that helped make these things possible. As we enter the season of Lent, we recall that God created humans from the muck and the mud. From dust we were created and to dust we will return, yet through the love of God we are also reborn into eternal and abundant life. We pray for you and our partners for a blessed Lenten season. It feels like every few years extreme weather hits closer to home. Its powerful impact, whether experienced through gushing waters, ravaging winds or scorching fires, has affected our homes and churches. The news has shown us devastating images from Texas, Florida, the Caribbean, California, and the Pacific Northwest. In 2017 your Week of Compassion was able to respond at the beginning of these disasters, and now the long road of recovery begins. While the minds of many have already moved on, we continue to coordinate and accompany local communities in the rebuilding process. The work is just getting started. Other domestic and global disasters did not make it on the news. There were floods in Arkansas and Missouri and in Peru, Colombia, India, Nepal, and Bangladesh, just to name a few. There were droughts that created starvation and famine for millions of mothers and children in Ethiopia, Zimbabwe, Somalia, and Kenya. And of course, there are 66 million people who have been displaced globally because of conflict in their homes. Your Week of Compassion responded to calls for help across the globe. And, we continue to work with partners to alleviate the pain and loss felt in many of these communities. Your generous gifts have made all of this possible. As we enter the month of February, you will have another opportunity to show compassion to those in need by giving to our annual special offering. The Week of Compassion Special Offering allows us to come together as one church in the United States and Canada and give abundantly to the vital work we do together. These gifts bear witness to the powerful work of God and allow us to respond to crises in places close to home and far away. Your partnership through the Special Offering answers the voices in the wilderness asking for food, water, and shelter and lets communities who are struggling to find hope know they are not forgotten. For this, so many are grateful. Below you will find our distribution chart for 2017 showing the ways your financial gifts went to help people all over the world. These numbers represent rich and powerful stories, some you already know and others that we will share with you throughout the year. They are a witness that your gifts--your treasures and your hearts--are with vulnerable people who needed them most. Lives are made better by your support. Your gifts build a better world in ways More Than We Can Imagine. It has been called the world's most under-reported crisis and the world's worst humanitarian crisis since World War II. The famine in the east African countries of Kenya and the South Sudan has quietly killed thousands and thousands of men, women, and children. In Kenya, 2.7 million people - a number equal to the population of the states of Wyoming and Montana - are at high risk of starvation due to the ongoing drought that has severely affected the ability of families to grow enough food to feed themselves. With too little water - caused by several years of negligible rainfall - livestock have also died in record numbers. Andrew Fuys, a staff member with Church World Service, says in many parts of Kenya, "your livestock is everything - your food, your savings account, your social status." The crop failure rate has been a staggering 70% -- which has led to exorbitant prices for food, a cost that families (already struggling to make any money from their failing crops) cannot pay. Fuys notes that in certain parts of the country, markets completely collapsed so that no food was available even if families had money to pay. Cash for work programs and emergency food distributions through ACT Alliance partners help families meet their needs. Additionally, communities have begun farming two early maturing/ drought tolerant crops, have begun raising small-breed animals like shoats, and have received training in livestock disease control. ACT Alliance, in responding to this ongoing crisis, notes that "children, pregnant women, new mothers and the elderly [are] bearing the brunt of the calamity." Moreover, the drought and famine affected areas where the malnutrition rate was already the highest in the country. Improvements in water technologies--such as sand dams and rainwater harvesting--aim to alleviate the emergency situation and provide sustained resources for the community for the future. Water is life, and where there is not enough water families starve, babies die from diseases caused by poor hygiene, hungry adults are increasingly unable to work, and nations whose economies are hobbled are increasingly unable to help their people as food prices reach unattainable levels. Fuys notes that during the worst of the drought, the price of staples went up more than 30% in many places in the country. Where there was food available, there was often no money and ACT Alliance creatively used cell phone money transfer technology to give families small amounts of money to tide them over, or to help with school fees or health needs. Your gifts to Week of Compassion have helped make possible these responses. Your continued generosity can help bring life-giving water to our neighbors in Kenya, South Sudan, and around the world. Thank you.